The classic white cultured pearl set is an absolute essential! This gorgeous white set is created from genuine high quality freshwater cultured pearls. Carefully grown over many years, they have been gently harvested and matched to the strictest of standards. This set is part of hand selected selection of gorgeous freshwater white cultured pearls. You will enjoy the versatile 7.5 to 8.5mm cultured pearls size - a perfect size for both business and pleasure. This beautiful AA quality set features outstanding AAA luster, slightly off round AA shape and AA body. 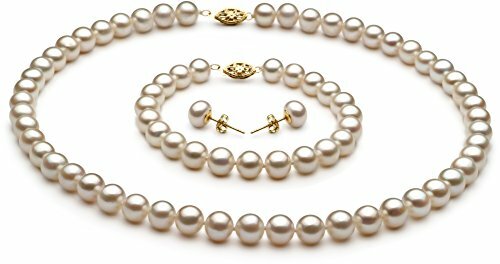 This set consists of a beautiful 7.5 to 8.5mm white cultured pearl necklace, accompanied by a matching cultured pearl bracelet and a pair of 14K yellow gold post mounted cultured pearl earrings. Included are matching butterfly backs to secure the fine and beautiful earrings. and alloy fishhook clasps. This set is carefully hand strung, using the finest silk thread. Double knots are hand tied between each and every cultured pearl - to protect the cultured pearls from rubbing against each other. Purchasing a complete ensures that all your cultured pearls will be perfectly matched. A set also offers versatility in combinations and looks. Your set will be carefully packed and shipped to you in an elegant jewelry box and accompanied by lots of free extras. If you choose, we would be delighted to gift wrap your purchase and turn this set into an unforgettable gift.